Another from a number of interesting period photos from a glass negative sent Alun Pugh of Leeds (UK) " Can you please identify vehicle outside Royal Clarence Hotel, reg. plate of Y99. Somerset I believe?" -- A British built cca 1897 Daimler 6.5 Wagonette originally owned by G H Pruen who used it to transport guests from the railway station to his Royal Clarence Hotel in Burnham on Sea, Somerset. The Car is existing today and is now at The Haynes Motor Museum in Yeovil. Read More ! 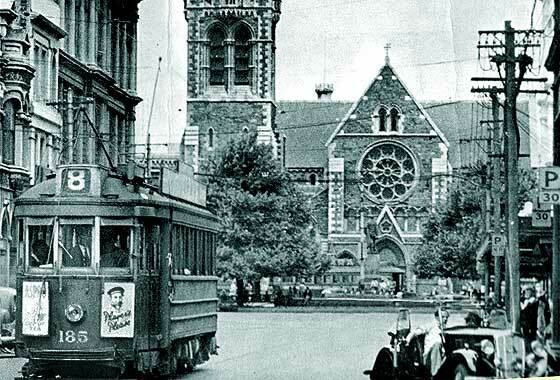 Another puzzling photo received from Mark Dawber (New Zealand) posted on Facebook requiring identification; steam car - presumed to be a Locomobile? 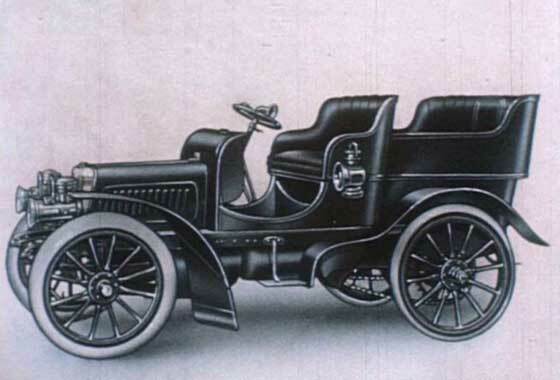 -- Indeed a Locomobile who were an American steam car manufacturer founded 1899, buying patents from Stanley Brothers. Partners split resulting in Locomobile and Mobile. This is a cca 1901 Locomobile Model 5 Locosurrey four-seater, most production being two seaters. Changed to petrol power cars 1903, selling steam to Stanleys. Another puzzling photo via Mark Dawber (New Zealand) posted on a New Zealand website requiring identification. 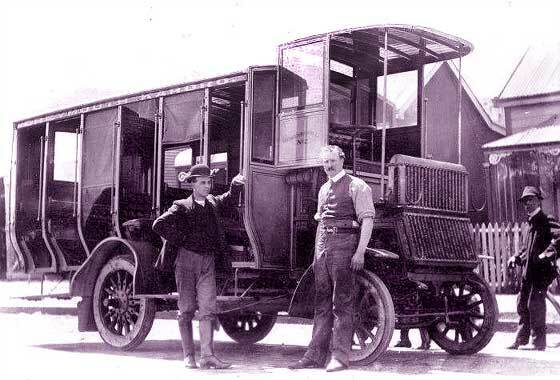 -- Intriguing photo which seems to show a cca 1902 Stirling Open Sided Omnibus. 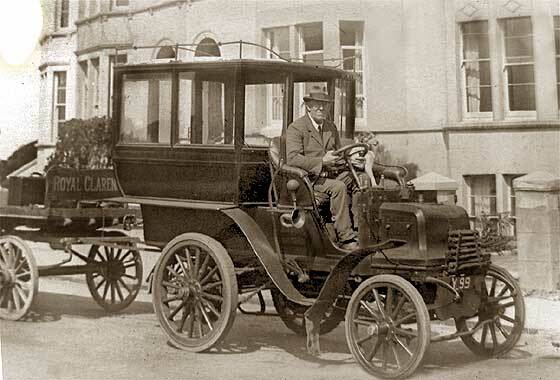 Stirling were a coachbuilder in Edinburgh in 1897 and were making Daimler chassied vehicles with Panhard Levassor engines with own bodies before Daimler UK made any. Probably a Daimler Germany commercial vehicle via UK before Daimler UK got going. Stirling went bust by 1905. Cinema screen grab taken from a British short film "Central Scotland" issued by the Scottish Central Film Library, division of Scottish Council For Educational Technology. Made 1962 reissued DVD in 2009. -- There are a number of photos of Scottish Albion cars of which this is one. This is one of the relatively early ones being a cca 1903 Albion A3 12HP Rear Entrance Tonneau. 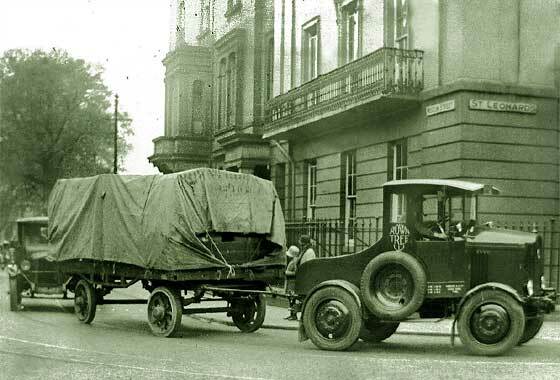 Founded 1899 in Glasgow, became very famous for rugged commercial vehicles. Became Leyland, name lasted to 1980. 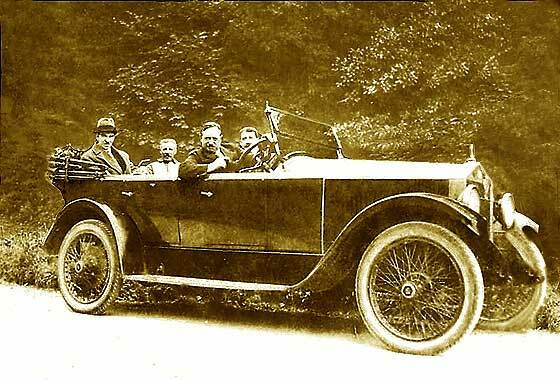 Picture of a very lovely car sent to us by John Green (UK) " ... on a postcard from about 1905. Unusual in that it does not have a front radiator cap." -- Gorgeous machine which our Ariejan Bos advises is a cca 1903'4 Panhard & Levassor Demi-Limousine. Unusual bonnet used for a very short period. Appeared end 1903 and is noticeable by a filler tube/cap located halfway down the bonnet on the left side (as on photo). Later in 1904 it moved to the 'normal' position at front centre. Cinema screen grab taken from a British short film "Central Scotland" issued by the Scottish Central Film Library, division of Scottish Council For Educational Technology. Made 1962 reissued DVD in 2009. 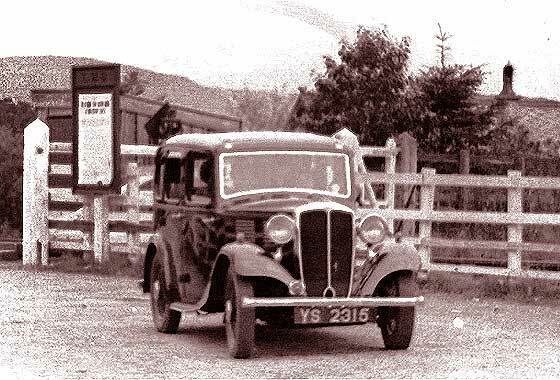 -- Number of photos of Scottish Albion cars and it was being questioned if this is another Albion. No. This is an English car built in Coventry by company started 1869 to make bicycles. This one was made in 1910 and is a cca 1910 Swift 7HP Two-Seater. Badge design changed soon after. Another lovely photo via Mark Dawber (New Zealand) notated as a vintage car in the yard of Albion Hotel Westport New Zealand 1912-'29, requiring identification. -- French made car from Venisseux, Lyon, by a company started by Marius Berliet in 1899. 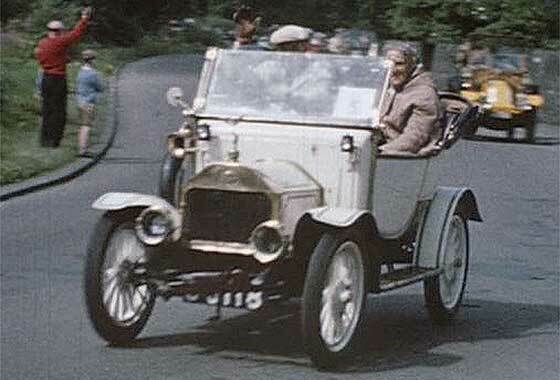 His cars were licenced by 1906 to Locomobile in USA. This looks like a cca 1913 Berliet Model AM Torpedo. Berliet also made large commercials and tanks for WW1, and commercials only after WW2. 1967 became Citroen, and 1974 Renault. Another puzzling photo received from Mark Dawber (New Zealand) questioning the make of the car. Not a Talbot, is it a Mors? -- Lovely picture showing an old car being used a saw bench. It seems to be a fixed rig because no tyre on the rear wheel. Intriguing how they got the drive through right angle?? It is indeed a French Mors and from the angled crease in the removed bonnet, this would seem to be a cca 1913 Mors RX 12 CV Two-Seater. Helped and then bought by Citroen in 1925. Another interesting photo received from our regular contributor Andrew Kostin, Moscow (Russia) saying" Could you please ID this photo? 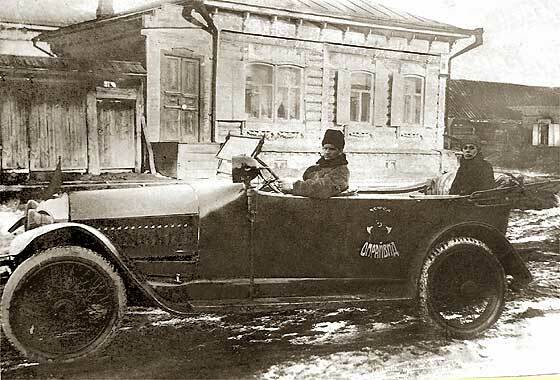 It was taken at the beginning-middle 1920s in Russia". -- A distinctive grille, not local, probably American. 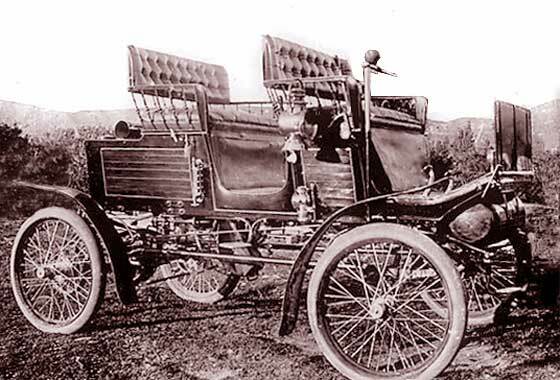 Two cars have very similar grille and similar/number louvres, cca 1913'14 Apperson and 1915'16 Pathfinder. Straight windscreen-supports and wide wheel hubs favour the bent c1916 Pathfinder 1B LaSalle Touring. NOT a positive ID! Another lovely photo via Mark Dawber (New Zealand) notated as Frank O'Flynn's car c1916, requiring identification. -- Inconsistencies. Obviously a Model T Ford. Angular rather than curved bonnet, so has to be before 1916. Scuttle board is straight to the windscreen rather that curved, so has to be before 1915. Sectioned rad at bottom so post 1916. Acetylene heads, and should be kerosene side lights to 1919, thereafter none. So this is a cca 1915 Ford Model T Runabout, updated. 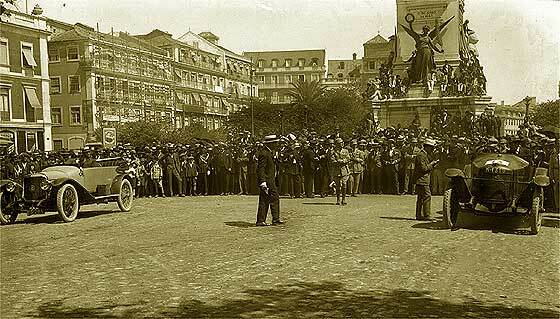 Another puzzling photo received from regular contributor Joao Ferreira (Portugal) of two cars on the starting line of a race called "Km de Arranque da Avenida" which took place in Av da Liberdade, Lisbon,on 18 June 1922. The car on left is a Panhard & Levassor. What is car on right? -- American. Faint outline of a logo on rad. Unusual radiator for marque. 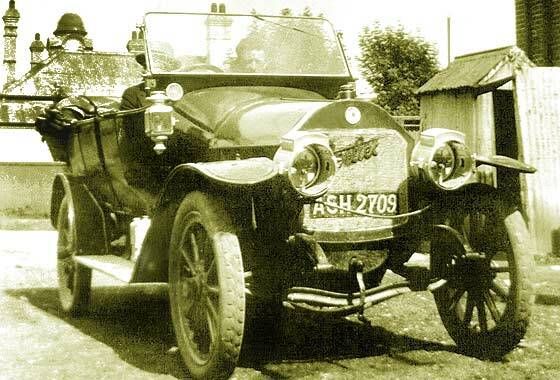 Two of our experts agree this is a Detroit built car, a cca 1916 Detroiter Model F Touring, probably 4 cyl, from Briggs-Detroiter Co.
Puzzling period photo received from Adrian Robson (UK) from a family album of a car he is trying to identify in his family history research. The family lived in County Durham so the picture may have been taken there, or elsewhere! -- The car is RHD so suggests may have been taken in UK, but no sidelights which would have been mandatory. Car is American trying to copy the Rolls radiator. Headlamps and wheelhubs suggest cca 1921 Moon 6'42 Touring made in St Louis Mo. 1905-1930. Another interesting period photo from a glass negative sent to us by Alun Pugh of Leeds (UK) " Can you please give me more information on this AEC lorry, registration EK2837, Wigan plate". -- Wigan Borough Council reg. indeed early 1923. Lorry was made by Associated Equipment Company evolved from the London General Omnibus Co (L.G.O.C.) and made commercials and also sold re-conditioned ones mainly for them to 1925. 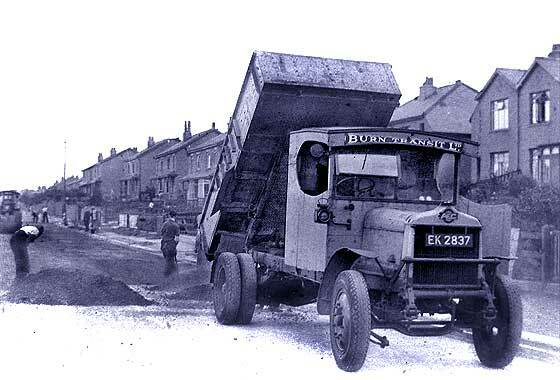 This is cca 1923 AEC 'B' 3-4 Ton Tipping Lorry. Another badly patterned period photo which was a glass negative from Alun Pugh of Leeds (UK) " Can you please identify this vehicle in Ross on Wye. Reg plate RO 7094....Hertfordshire". -- We have attempted to get rid of the pattern but the photo remains very unclear. Indeed Hertford County Council registration issued mid 1927. Five stud wheels, horn through scuttle and swiveling dipping badge bar. We are relatively sure this is a cca 1927 Morris Oxford Flatnose Two-Seater and Dickey. Interesting period photo received from Marek Bernas (UK) saying "Could you please identify the attached vehicle...family archive - location and date unknown." -- The car is left-hand-drive which suggests photograph may not have been taken in UK, Chauffeur's uniform also bit jazzy for UK! Car is American so probably USA. Scalloped bonnet and has fewer wheel nuts at the back than the front. 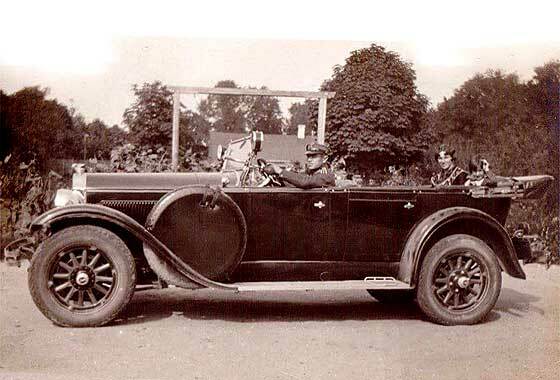 This suggests car is General Motors cca 1928 Buick Master Six Touring. 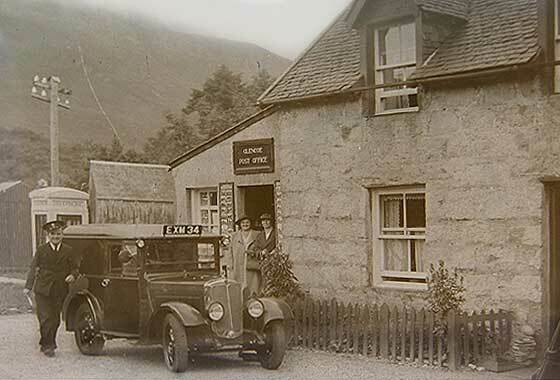 Another interesting period photo which was a glass negative from Alun Pugh of Leeds (UK) " Can you please identify this Royal Mail van outside Glencoe Post Office....a London reg plate?" -- Registration EXM 24 is one of the London County Council registrations which were issued in large blocks country wise to the 'Post Office' formally Royal Posts founded in 1516 by James IV to try and retain controlof the Scotish Privy Council. This is a cca 1933 Morris Minor Post Office 5cwt SV Van. Another interesting period photo which was a glass negative from Alun Pugh of Leeds (UK) " Can you please identify this lorry with Rowntrees on side. Taken in York." -- No registration is visible so not much help in dating. Vehicle is French, initially from Marseilles but later in Paris. Built four-wheel drive vehicles from 1911, also Tracteur d'Artillerie Roulante TAR for French Army. This is a cca 1934 Latil Traulier Tractor Unit. Probably licence made in UK by Shelvoke and Drew. Renault in 1955. Another interesting period photo from a glass negative sent to us by Alun Pugh of Leeds (UK) " Can you please identify this saloon with a Glasgow reg plate YS 2315? It is on the Connel Bridge, Oban. " -- Registration YS 2315 was issued by Patrick Borough Council, Glasgow, in Scotland. The car is British and is a cca 1935 Standard 10 Saloon made by the Standard Motor Company in various versions between 1906 & 1961. This version between 1934-36, four cylinder sidevalve 1343cc. Another interesting period photo from a glass negative sent to us by Alun Pugh of Leeds (UK) " Can you please identify WW2 vehicle parked outside the AEC works in Southall? Reg plate is WN 9620 I think...rather faint...Swansea -- If Swansea CBC then issued 1936. 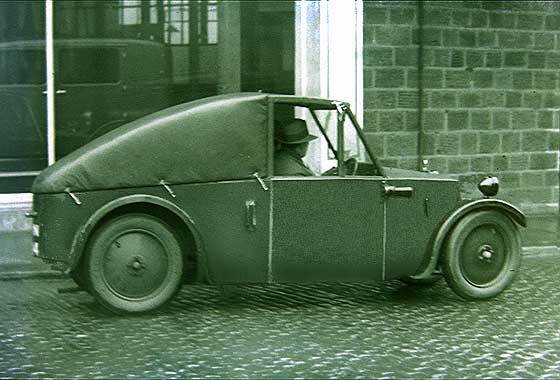 Car made by a company making sidecars in 1922 for motorcycles, Swallow Sidecars. 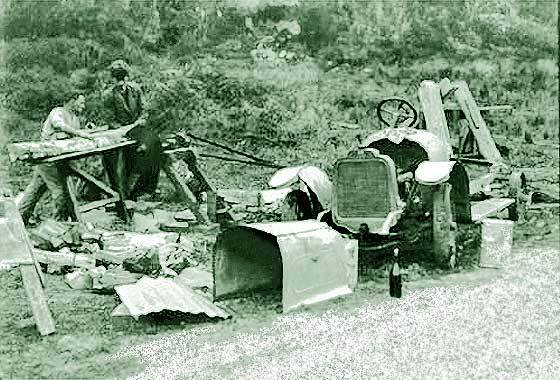 Then made bodies for Austin 7s and then own SS Standard sports cars. 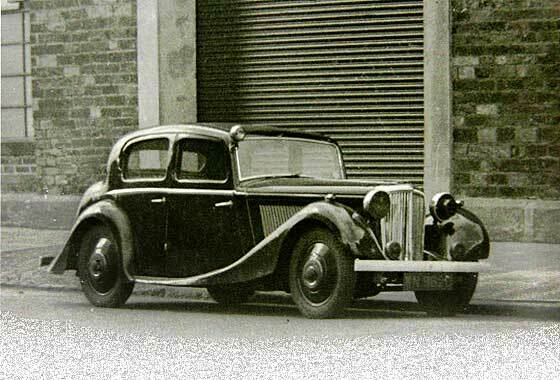 This is a cca 1936 SS Jaguar 1.5L Saloon, with wartime blackout masks. Another puzzling photo received from Mark Dawber (New Zealand) questioning the make of the car. Is it a Morris 10? -- Quite difficult to make out from a cut-off photo but it is a Morris. Research suggests that main identification feature is the radiator with the vertical chrome dividers and a chrome surround. Could be 8,10,12,14 or 25. Only the 8 had soft top with wipers on top of windscreen and detachable windows, others had Special Coupe with wipers on scuttle. 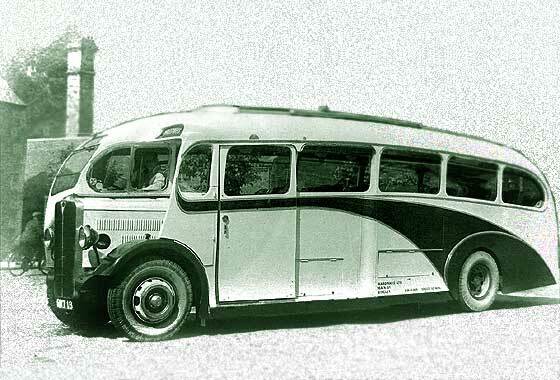 So, cca 1938 Series 2. Another from a number of interesting period photos from a glass negative sent to us by Alun Pugh of Leeds (UK) " Can you please identify vehicle parked outside a building in Southall, West London, reg KMF 753?" 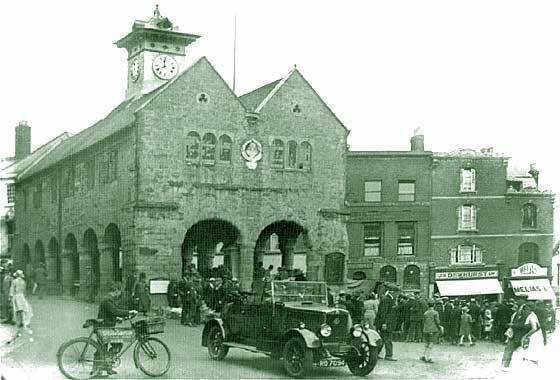 -- Registered with the Middlesex County Council in early 1939. British recognisable flutes on bonnet and having two side windows with divider on the rear window. Wartime photo as one of the headlamps has blackout mask. 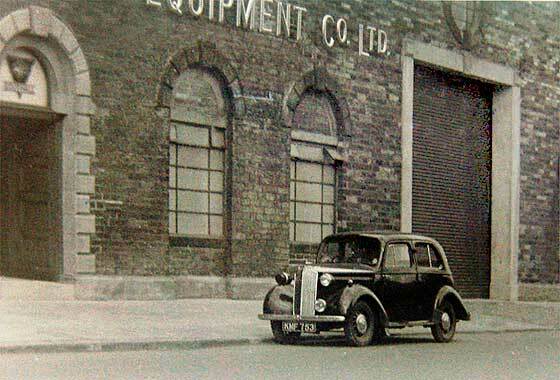 This is a cca 1939 Vauxhall 10-4 Saloon. Another interesting period photo from a glass negative sent to us by Alun Pugh of Leeds (UK) " Can you please identify this lorry with an SG reg, Edinburgh, and an Edinburgh company. Looks like a local quarry". -- Registration CSG 723 is early 1939 Borough Council of Edinburgh, Scotland. Lorry was designed by Ford America and not entirely clear if then made in the UK, when it would have been called a Fordson. 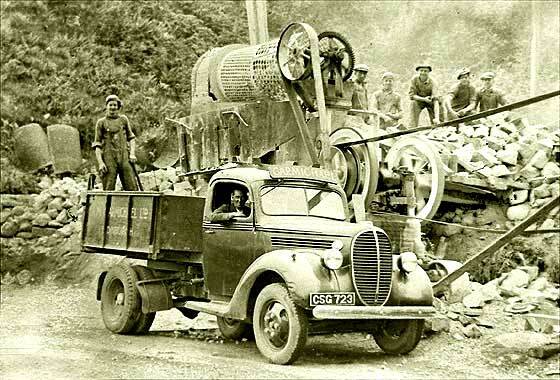 This vehicle would seem to be a cca 1939 Ford V8 1.5 Ton Tipper Truck. Another interesting period photo from a glass negative sent to us by Alun Pugh of Leeds (UK) " Can you please identify this vintage bus/coach operated by Wardways of Bingley. Reg. GWT 18 [maybe another number], which is Yorkshire". -- Registration is County Council of West Riding of Yorkshire issued mid- late 1947. This is a 'half cab' single decker, a cca 1947 AEC Regal I Coach, with Santus (of Wigan) 33-seater coach body, new August 1947, Wardways Bingley, Yorkshire. Another interesting period photo which was a glass negative from Alun Pugh of Leeds (UK) " An odd little car....can you help? ". -- In short, regretfully NO! This photo has done the rounds of most of our experts and none of them have come up with even a suggestion. It seems a well made vehicle which appears to have British horn and lights. It seems too well constructed to be a special home-made machine, but seems to have very limited uses with the tapering hood cover over pickup body. Another interesting period photo which was a glass negative from Alun Pugh of Leeds (UK) " Can you please identify this lorry? 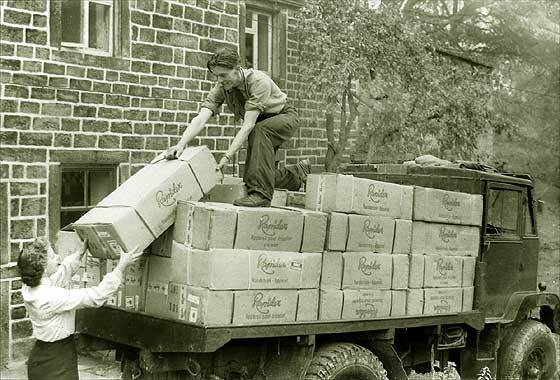 Not an easy one this....a lorry being unloaded in West Yorkshire ". -- No registration is visible so not much help in dating. Neither are the boxes being unloaded beyond that they are dozens of knitting machines by Rapidex of Bern, Switzerland, from Rapidex Knitting Centre, London? The lorry looks War Surplus but we have not been able to identify precise maker.